I’m excited to share an annual update on my Filofax, which is a critical piece of my time management. I not only use my agenda to keep track of my calendar, but it also houses my daily to-do lists, project management, and work notebook. This year I decided to literally pull the project management part out of the rings of the planner and into its very own notebook. I find the Large Moleskine Volant Notebooks fit perfectly in my A5 size Filofax. I also dedicated one to a new work notebook to help me keep track of my YouTube channels and blogs. I love having the option now to store these notebooks in the back of my Filofax or pull them out and keep them separate. It also makes it much easier to access these notes, since they had a tendency to get neglected in their old home clipped into the binder rings behind my hefty Day Per Page calendar. 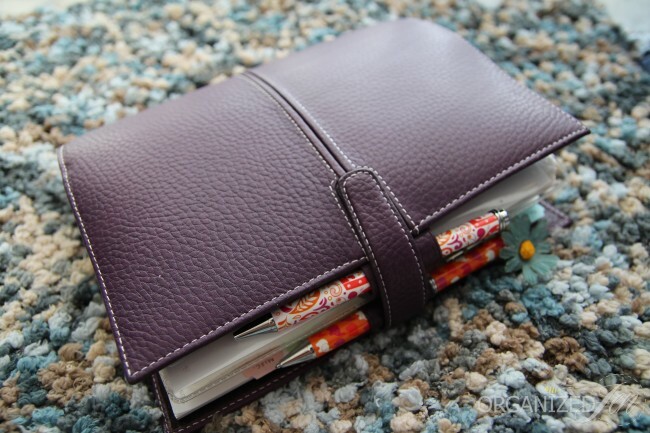 I have a Filofax Finchley A5 Leather Organizer in the color Imperial Purple. Sadly, this model is no longer available, but Filofax makes beautiful agendas in other models and sizes as well. I prefer the A5 size, because I mostly use my planner at home and the larger size isn’t an issue since I don’t have to lug it around to school or an office every day. That being said, I probably would lug this size Filofax around if I did work outside the home just because I love it so much. It is small enough to manage, but large enough to accomodate three calendars, one of which is a Day Per Page where I keep track of my daily to-dos, as well as a pen pouch filled with office goodies, sticky notes galore, and the two aforementioned Moleskine Volant notebooks. 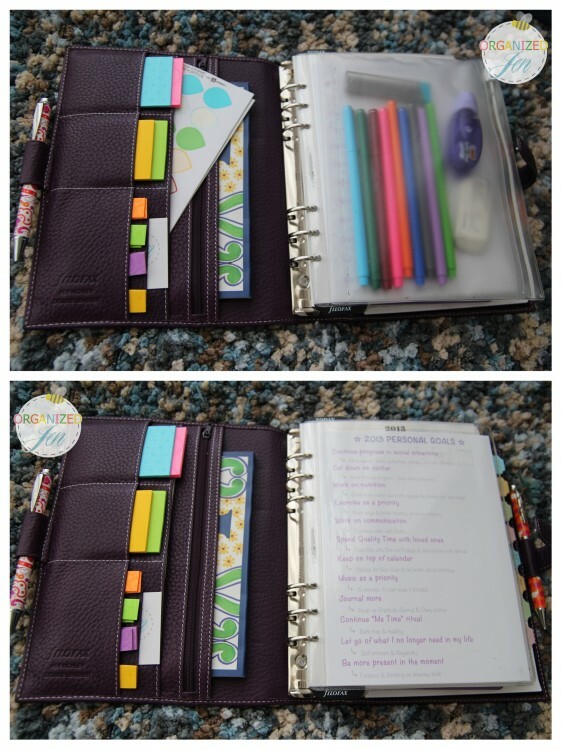 The planner comes with some built in pockets for quick access storage. I prefer to keep an array of sticky notes and labels in the interior front side. Lately, I’ve taken to using Post-it’s Full Adhesive Notes and Labels for additional note options on my Day Per Page calendar. I prefer the full-sticky-back Post-its because they stay put, but are still easy enough to move around if necessary. I even cut some down to make page marker sized versions for smaller note options. Additionally, I always keep some Martha Stewart Home Office with Avery Removable Color-Coding Labels tucked into a flap for easy task management. I’ve assigned each color to a different task I complete on a weekly basis around the house and affix them to the bottom of the calendar page to which they apply. It’s easy to move these labels around just like the full-sticky Post-its, because they’re removable and the tear drop shape makes it easy for someone like me with super short nails to pick them up off the page. The Finchley comes with two pen loops built right into the planner, in which I keep a Jonathan Adler Pink Elephant Pen & Pencil Set I picked up at Barnes & Noble. I was using a lovely Vera Bradley set last year, but I prefer the Jonathan Adler ones because they are a bit larger and don’t accidentally slip out of the loops. 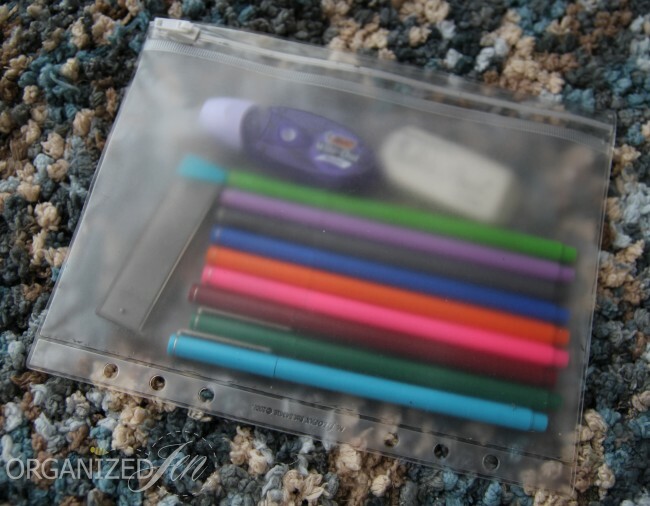 I also keep a Filofax A5 Ziplock Envelope tucked into the front of my Filofax to house my essentiel supplies. I have a nice selection of Marvy Uchida LePen Fine Line Markers that I use for color coding my calendars and notebooks, as well as extra pencil lead, a large eraser, and Bic Wite-Out Mini Correction Tape. I prefer not to keep this pouch clipped in, because I always pull it out to the side whenever I am writing in my planner. 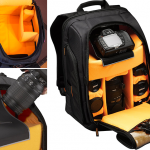 It fits snugly inside when not in use. I mentioned I use three calendars in my Filofax. I use the Month On Two Pages for general planning, including events, appointments, travel, birthdays, and holidays. I keep three Full Year Horizontal Planners specifically for travel. I have the current year as well as the previous and next year to help me in my trip planning process. The calendar I use most frequently is the Day Per Page. Each day of the week has its own page split into two columns. The lefthand column includes time increments. I use this side to keep track of appointments and events. There’s also usually room on any given day for sticky notes. I use the righthand column for my daily to-do list, which I generally work on the night before. I always write my to-do lists in pencil, because I find I often rearrange and change things as the day goes on. The weekend is arranged in the same way but takes up one page only (half for Saturday, half for Sunday). I keep past days of the Day Per Page together with a Tartan Oli Magnetic Paper Clip, which you can find at The Container Store. This three-calendar system works perfectly for me to help me keep on top of household and work-related tasks as well as travel, appointments, and special events. I use the iCal program on my iPhone as a general on-the-go calendar. I synch this up with my Month On Two Pages calendar once a week to make sure I don’t miss anything. It’s so convenient to be able to make appointments or dates on the go with just my iPhone and then pop them into my Filofax later on. At the back of my Filofax, I keep a pad of paper tucked into a mesh pocked built into the agenda for notes and scribbles. My two Large Moleskine Volante Notebooks fit nicely back there as well. I love that I can just slide them out when I want to work on them or take them separately when traveling. I used decorative stickers to jazz them up a bit. Having cute organization tools helps me stay motivated to actually use them. Of course, this might not be as effective for everyone. My advice is always to find what works for you and stick with it, no matter how silly or impractical others might find it. I used a selection of the Martha Stewart Home Office With Avery NoteTabs to easily create categories and subcategories for my notebooks (These are sadly no longer available online. I found some at Staples on clearance a couple of months ago). Cute and functional? It’s hard to beat that in my opinion! I go into much more detail in the coordinating video (show below), with closeup shots of each part of my Filofax (with the exception of the Full Year Horizontal Planners, which I forgot to include for some reason). I will be a sharing a follow-up blog post in the next day or two with a closer look at my CNP (CreativeNecessitiesPouch) and links to available products if you’re interested. I’d love to see photos of your Filofax or other type of agenda/planner. Feel free to tweet them to me @OrganizedJen if you care to share! nice work Jen! Loved it…I’m leaving here inspired to carry on with my House Frau routine!! Thank you so much for making this video. I am starting grad school this fall along with teaching, and I was looking for a new way to keep myself organized. I have a Filofax, but sometimes that isn’t enough to keep m on track. You always come up with the most creative ideas. Thank you for doing this video ~ it is really inspiring. I also use a Filofax and am always looking for functional ways to organize my life! I would really like to start mapping out some of my projects because I find that I may have a list of projects but they don’t get done because I am unsure of where to start. Thank you for the inspiration! It was your original Filofax videos that led me to you. Thank you for the update and also thank you for the tip on the magnetic bookmarks. I’ve now got a little set for my Personal size Filofax and I’ve not looked back. I’ve been watching your Youtube spots for a little while now and have come to the conclusion that I can use some (ok, lots) of help in the organizing department. Thank you for all your ideas, suggestions and help. What a fabulous job you did on this video. Your presentation was beautifully executed and very thorough, and as a result, I was able to pick-up some great ideas to help me with both my personal and business agendas. 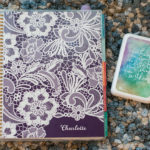 I especially loved seeing how you incorporated the additional notebooks, as I often use a basic spiral notebook to organize goals, notes, idea’s and of course list. Only now, I see that I can get more creative in doing so. Also, I really like the letter stickers and would love to know where to purchase those. Thank you so much for the effort and time that you put into your videos. It is very much appreciated. I bought them at Michaels quite awhile ago (I keep a nice collection on hand at any given time). I’d like some more of those same ones myself and if I happen to find them again I’ll either tweet or vlog on MHWL about it. Might look next week! Love how you decorated your notebooks! Those stickers are so cute! Loved watching your new Filofax update this morning! I was wondering where you got those colorful letters from that you stuck on your Volant Cahiers? They looks so cheerful! As for the pens, have you ever tried the Pilot Frixion pens? They are completely erasable, so you wouldn’t need to note appointments in pencil and have your color-coding in place immediately. Or reduce the bulk in your front pen pocket by using two 4-color Coleto’s? Not erasable, but very nice writing experience. But I guess since you don’t take your Filofax out and about, there’s no real need to reduce the bulk, right? Thanks for the suggestions! I love my LePen pens, but I’m a bit of an office supply junkie & love trying out new products. I’ll let you guys know if I find those stickers again (I threw out the original packaging long agi) either by Twitter or in a MHWL vlog. I’m going to look next week! Hi Jen, thanks for the videos, I follow all your channels but what led me to you was the organization ones. It helps so much! I am a long time filofax user as well and love them. Where did you get the cleaning cloth for the computer? I need one or several of those! 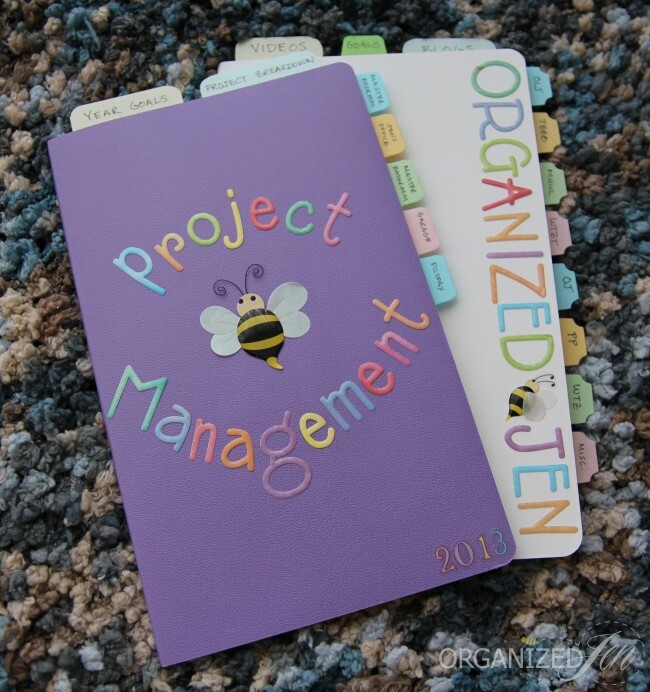 Love the project management ideas ..will you be doing the time management soon? …thanks again for all your great ideas! Hi Jen! I just loved your video on the Filofax, and your detailed post about it on your blog and where to get items is suuuper helpful, I am interested in the Large Moleskine Volante Notebooks but your link goes to an Italian site to purchase?? Do you think you could please tell me where I could purchase those in the states? Hmm, that’s odd! I usually buy mine at Target or Barnes & Noble. They’re also available on Amazon. I’ve even seen them sold at book kiosks in the airport! I too found your videos after watching your original Filofax videos. This new one was great. I especially enjoyed hearing how you use your Molesine. I went to B&N the day I watched and bought a set for me. Keep p the great work. I just wanted to say that I have been watching you videos for a little over a year and find them very useful. I have used or adapted your ideas for what works for me. I rxantly found the full adhesive sticky notes and are enjoying them. In the video you stated that you cut some down and was wondering how? My attempt could have gone better. I am looking foward to future videos. Thank you for getting and keeping me orginized. I peeled off about half the stack and used a sturdy tabletop paper cutter to keep them straight. I have been watching your videos for the longest time now, and have been loving your agenda and project management updates! I was wondering if you could do a moving organization video, cause I am in need of some desperate help! I would love for you to help me out on how to pack, organize the boxes, labeling, etc. Also, a list of product recomendations would help out a lot! Thanks your help! I went on filofax.com and I cannot find the day on a page for the A5. Do they not sell it anymore? If so, do you know of any other company that sells a similar day on a page? I think you can find them on Amazon right now. I have no idea why they’re not available on the Filofax website. Maybe they sold out of the current year & will just be stocking for 2014 calendars in the late summer/early fall? I’m off to buy some now! Your video and blog has made me so excited to buy a filo fax and moleskine notebook. where did you get the lettering? Thank you for inspiring me to get a new filofax and make it not only smarter, but also more decorative! 🙂 Though, mine has not become as pretty as yours at all. Hi Jen..Loved your video. This will help me get back the organization that I need. I have been looking at the A5 size models. I used to have a Day Timer that I used religiously until it was stolen. Since then I haven’t been able to get back into a system that seems to fit my needs. I think I got discouraged by the theft that I haven’t really put as much effort in it as I should have.I really need to get a planner so I can put all my list in one central system. I have a daily to do list, a long term to do list, etc. I know the model you are using is no longer available but could you maybe suggest a model that is as close to yours as possible. Thank you so much for your time. I would recommend finding a Filofax retailer near you and going to see the different models in person. That way you can find one that suits you best! Have watched your videos religiously for the past month and also been reading your blog. Hearing about you gearing up for the winter season makes me want all the warm cinnamon scents but hear in Australia we are just gearing up for a very hot summer. Ebay is a great resource for filofaxes and filofax components. I use the plastic business card pages all the time, and the paper receipt envelopes are invaluable for client/project and travel management. And I couldn’t do without the filofax paper page punch. Very inspiring! Thank you for sharing this. I am on a new “life project” of not just getting organized but setting goals and getting back to doing things I love after some tough years. I feel inspired as I too LOVE stickers and lists and pens. I was watching your kitchen organizing but couldn’t resist watching the planner video. I agree that if it helps you stay motivated do it. So I’ll kick off this new chapter of my life with a new notebook and planner and lots of cute stickers and colours.